RESTON, Va. – Adding functional imaging to structural imaging of patients with ventricular tachycardia (VT) has the potential to improve current VT ablation strategies, according to new research published in the January issue of The Journal of Nuclear Medicine. Iodine-123 metaiodobenzylguanidine (123I-MIBG) SPECT imaging, when combined with cardiac magnetic resonance imaging (MRI), helped to identify specific subsets of heart tissue more prone to arrhythmia, which may allow physicians to achieve improved VT suppression and shorter procedure times. In the study, researchers followed 15 patients with ischemic cardiomyopathy who were scheduled for radiofrequency ablation for drug-refractory VT. Each patient underwent imaging with 123I-MIBG SPECT and cardiac MRI, as well as high-resolution bipolar voltage mapping. These three mapping tools assessed various adaptations found in VT: abnormal innervation, tissue scarring and low-voltage area, respectively. The adaptations were then compared to determine which were present in the affected heart tissue. Areas with abnormal innervation, cardiac tissue scar and low bipolar voltage were seen in all patients. While approximately 25 percent of patients had abnormalities found by all three mapping tools, researchers found that significant areas of the affected heart tissue showed adaptations only noted by one or two of the tools. The largest of these areas had abnormal innervation only (18.2 percent), cardiac scar tissue and abnormal innervation (14.9 percent), and MRI scar only (14.6 percent). In all cases, the VT site of origin was localized to areas of the tissue with abnormal innervation and MRI scar, identifying an area of abnormal tissue that is likely to be an appropriate target for VT ablation. 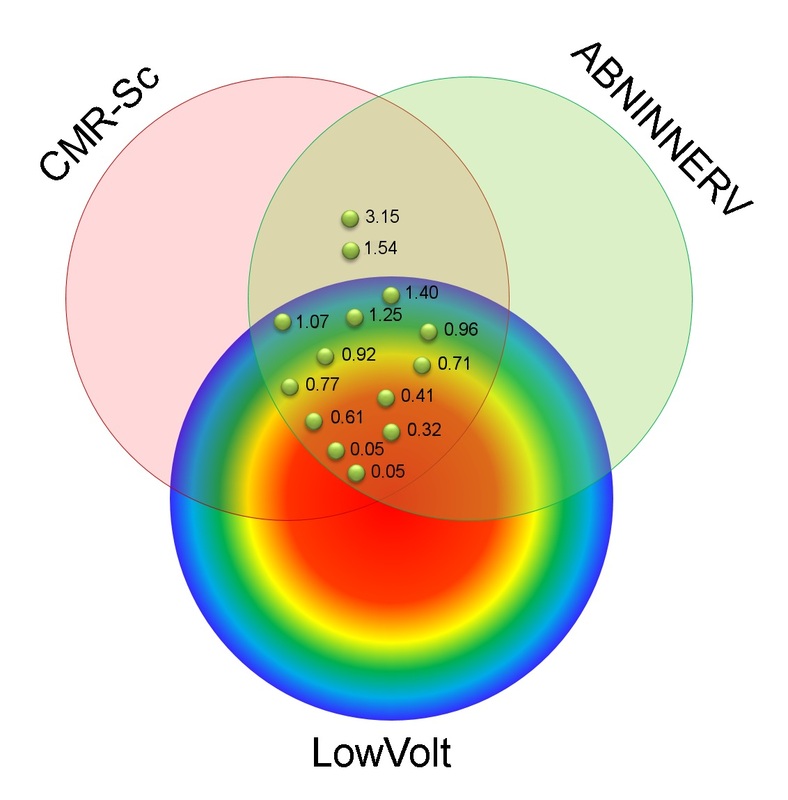 FIGURE: Successful VT channel/exit site location relative to CMR-Sc, LowVolt, and ABNINNERV. Different colors further stratify EAM of LowVolt area according to voltage. Each green point represents VT channel/exit site according to local bipolar voltage. The authors of “Ventricular Tachycardia (VT) Substrate Characteristics: Insights from Multimodality Structural and Functional Imaging of the VT Substrate Using Cardiac MRI Scar, 123I-Metaiodobenzylguanidine SPECT Innervation, and Bipolar Voltage” include Hasan Imanli, Kiddy L. Ume, Tamunoinemi Bob-Manuel, Mohammed Abdulghani, Yousra Ghzally, Alejandro Restrepo, Vincent Y. See, Stephen Shorofsky and Timm Dickfeld, Maryland Arrhythmia and Cardiology Imaging Group (MACIG), Baltimore, Maryland, and Division of Cardiology, Department of Medicine, University of Maryland School of Medicine, Baltimore, Maryland; Jean Jeudy, Mark F. Smith, Wengen Chen and Vasken Dilsizian, Maryland Arrhythmia and Cardiology Imaging Group (MACIG), Baltimore, Maryland, and Department of Diagnostic Radiology and Nuclear Medicine, University of Maryland School of Maryland, Baltimore, Maryland; Jagat Bandhu Mahat, Division of Cardiology, Department of Medicine, University of Maryland School of Medicine, Baltimore, Maryland; and Refael Itah, Biosense Webster, Haifa, Israel. To schedule an interview with the researchers or for more information, please contact Rebecca Maxey at (703) 652-6772 or rmaxey@snmmi.org. Current and past issues of The Journal of Nuclear Medicine can be found online at http://jnm.snmjournals.org.